Ever since Spider-Man made the leap from comics to blockbuster films, I’ve always associated window washers with the Marvel superhero. After all, they share many characteristics: They constantly climb up and down windows, they’ve clearly never heard of acrophobia, and cling to their lives with just some powerful strings. The aforementioned descriptions are why Winbot seems so endearing to me. Straight from the Ecovacs lab, the Winbot is a new home-cleaning robot that is designed to help you make your windows sparkly clean. Can you see clearly now? Winbot made a stop to our New York office this week to give us a quick demonstration of its power. Weighing approximately 4.5 pounds, the square-shaped robot uses powerful suctions to hold itself vertical on the glass. 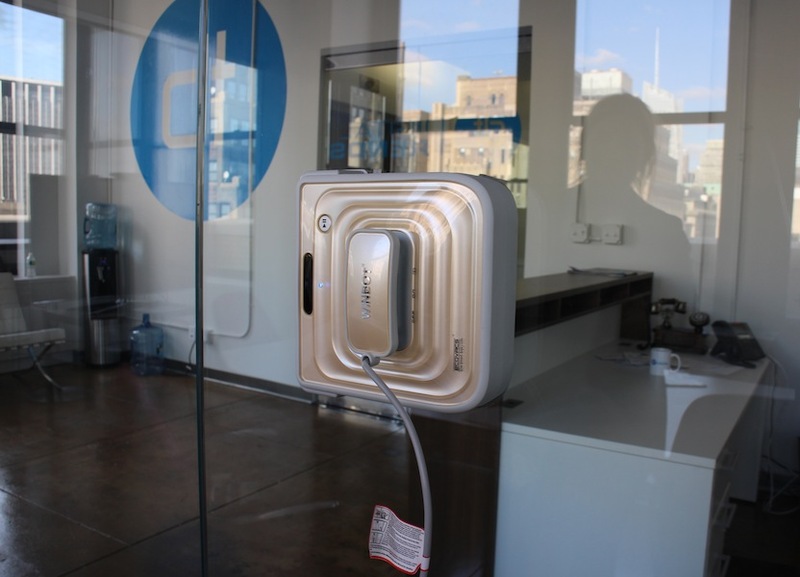 To use, simply plug Winbot’s power cords into the outlet and place the machine at the center of the window. Winbot uses tiny sensors to calculate the distance from the middle of the window frame to the edge. To do this, it will start from the center and run to the edge, before zig-zagging its way across your window. Because you attach microfiber pads on both the top and bottom edges of the robot, it leaves no residue behind. When the cleaning is done, Winbot will play a cheerful music to let you know it’s finished. Spider-Man won’t do that. And if he’s the same dude from Spider-Man 3, he probably just cries a lot instead. Although the Winbot will come in two versions (the 710, which cleans framed windows, and 730 for frameless windows) there are some restrictions with the automated cleaning. First, the microfiber pad is recommended for use with only Ecovacs’ specialized all-natural cleaning formula. “Ammonia or acid-based solutions will interfere with Winbot’s sensors,” Ecovacs says. “But these accessories are very affordable, and will cost between $6.99 (new microfiber pads, cleaning formula) to $59.99 (30 feet extension cord).” Second, the suction cups will not adhere to frosted glass or glass with stickers all along it, and won’t work with glasses during temperatures below 40 degrees Fahrenheit. So, if you have fancy frosted shower doors or a large window on the entrance door, you’re on your own for that one. 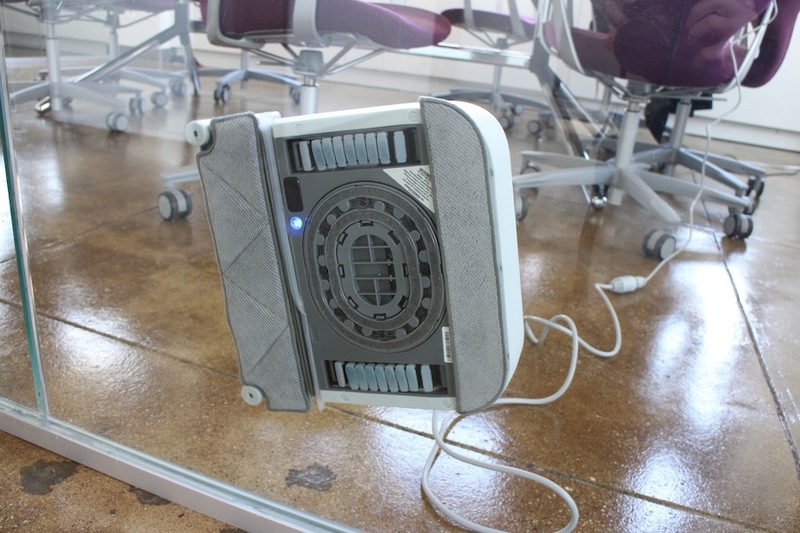 What the Winbot does have, however, is an emergency battery pack in case of power outages. If there is a loss of power, the battery will automatically kick in, allowing Winbot to hold itself vertical to the glass for up to four hours. This way, you won’t run to your living room to find Winbot smashed on the ground if a blackout strikes. If you need to go over heavilysmudged areas, it also comes with a remote control so you can force the robot back to certain directions. From our experience, it seems Winbot knows exactly where to go and cleans with almost no residue left behind (there was a tiny streak mark from the robot treads, but barely noticeable). The robot was audible, but the noise wasn’t overwhelming if you left it and walked away to another corner of the room. Ecovacs is currently working with major retailers to put these on the general consumer market, with a launch date some time this April. The Winbot 710‘s suggested retail value stands at $300, and the 730 at $400.